Count on us when you are looking for a plumber in the Kannapolis area who shows up on time and does what they say they’re going to do. Plumber in Kannapolis – Are you looking for a plumber in the Kannapolis, North Carolina area who shows up on time and does what they say they’re going to do? If so, call us at Hall’s Plumbing. You don’t just get our word; you get our on-time guarantee. If we are not on time, we pay you $5 for each minute we are late, up to $300, toward your service or repair. In addition, a highly skilled and expertly trained plumber will quickly diagnose the problem and explain how it should be addressed so you know up front what to expect. We offer a wide variety of plumbing services and repairs that will keep your home’s plumbing system in the best condition. 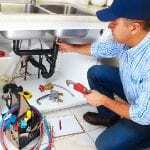 We also can send a plumber to your business to resolve any issues you have there. Some of the repairs we handle include well pumps, showers, toilets, faucets, pipe repair, water heater repair, and drain cleaning. Don’t hesitate to call us for all your plumbing needs. Our main focus is on delivering the service and parts that provide you lasting results. Complete satisfaction with both our service and your plumber is 100% guaranteed. If something doesn’t meet with your approval, let us know, and we’ll make it right. Our distinctive truck fleet is kept stocked with the most common repair parts, so it is rare that we can’t make a repair on the first visit. We do this because we respect your time and want to take care of your problem as quickly and effectively as possible. Call or today, and we’ll respond quickly to your plumbing needs. At Hall’s Plumbing, our plumbers proudly serve Mooresville, Statesville, Iredell County, Kannapolis, Conover, Newton, Maiden, Mt. Pleasant, Taylorsville, Davidson, Sherrills Ford, Denver, and Terrell, North Carolina.